Go from suite to slopes in minutes flat thanks to prime ski-in/ski-out real estate. Take a soothing soak one of the hot tubs (both indoor and outdoor!) while the kiddos play Sharks 'n Minnows in the pool. Hit the fitness center for a quick workout whenever the mood strikes - follow up with a steam 'n soak, thanks to onsite sauna and hot tub. Spacious condo-style suites are warm, inviting, and well appointed to help you and your fellow mountaineers feel right at home. Shops and dining abound in the heart of Park City Mountain Resort. Get more mountain time with super convenient access to the lifts. Head to historic downtown Park City to browse charming shops and tasty eateries. There’s both indoor and outdoor hot tubs for maximum relaxation. Pack your hiking boots, the Round Valley Trailhead is only 11 minutes away by car. Get ready to show off that swing – Park City Golf Course is just a 4 minute drive away! When planning an epic ski trip for your family you want your lodgings to be warm, inviting, clean, and - super important - convenient. That’s where The Lodge comes in. The Lodge at the Mountain Village is a cozy slopeside resort that has everything needed to make your vacation fun and easy. Perks begin the minute you arrive with complimentary covered parking, so you won’t have dig out your ride after a heavy snowfall (hooray! ), or brave the cold if you forget something in the car. At check-in you’ll be greeted by a smiling staffer at the front desk - which is manned 24 hours - before heading to your homey, well appointed condo suite. In the morning you can scope out the slopes from your private balcony while sipping freshly brewed coffee, before wowing the crew with a deluxe home-cooked breakfast. Once everyone’s finished carbo-loading on your world-famous chocolate chip pancakes (three cheers for en-suite kitchens!) just gear up and head out - the slopes are right outside! Nestled in the heart of the Park City ski base, this ski-in/ski-out resort gives you unbeatable access to the 7,300 powdery acres across the six-mile wide mountain that makes up Park City Mountain Resort. After a day well-skied, just mosey down the the Home Run trail to coast right up to The Lodge, or one of the aprés eateries in the village. Back at the condo, see who can swap snow jackets for swimsuits quickest for a traditional (and luxurious) aprés soak. Choose between both an indoor and outdoor whirlpool hot tub and let the jets work their magic. Spacious suites at The Lodge are tastefully decorated with individual style, with a consistent homey, alpine atmosphere. Every condo comes with a fully equipped kitchen and inviting living area, along with a private balcony and cozy fireplace for added mountain charm. Studios are great for couples with a queen murphy bed that folds up for added spaciousness, while a couple extra beds in the studio-loft and one-bedroom units make them prime for smaller crews. Bigger families and friend groups will dig the two- to four-bedroom condos, the largest sleeping up to ten mountaineers comfortably, with two full baths and sleeper sofas in the living rooms. Got some crew members not so keen on skiing? No worries! Even non-riders will love Park City Mountain. Nature-lovers will relish exploring the Wasatch Mountains’ tranquil beauty with a guided snowshoe tour, or admiring the scenery from a horse-drawn sleigh. A ride on the toboggan-style Alpine Coaster will delight thrill-seekers young and old, while the Flying Eagle Zip Line will take your trip to new heights. The Lodge even has an onsite ice skating rink! When you’re feeling a bit snowed out, take a break from the slopes and hop The Lodge’s on-call shuttle to Historic Main Street to browse over 100 boutiques and art galleries, dine at one of fifty different unique restaurants, or learn about the town’s silver mining history at the Park City Museum. Rollaway/extra beds are available for USD 75.00 per night. Air conditioning is not available at this property. Located in Park City, Utah 32 miles east of Salt Lake City. Known as the host of the 2002 Winter Olympics. 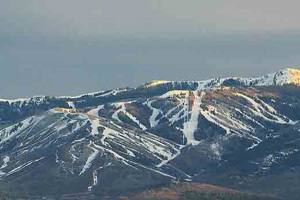 The resort is the main employer for the citizens of Park City. Park City was featured in the Xbox 360 and Playstation 3 game "Shaun White Snowboarding".